At Wilderness River Outfitters, we strive to provide everyone with their own unique wilderness experience. 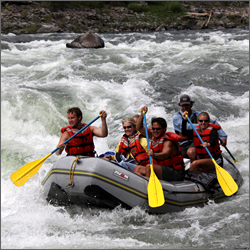 Established in 1972, we are a family owned operation that has perfected the craft of guiding individuals and families through the most pristine, stunning river systems in the northwest, from Idaho and Montana, to Alaska and Canada. Our friendly and professional guides customize each trip to the clients interests and abilities, making each trip one of a kind. Come see why when you raft with Wilderness River Outfitters, you come as our guest and leave as our friend!